actual foggiest hint as to regarding what sort of DMV does. …The VAT is just another head on a hideous monster, the Fair Tax would make us the world’s tax haven. The God-given right of property ownership denies our constitutional republic the right to tax individuals. Corporate tax is entirely acceptable, but individual income tax is a violation of the right to sovereign ownership of property. Completely wrong – every mature economy should have a VAT – economically its a no brainer, the only problems with it are proper implementation (mainly it must replace most existing taxes and thus simplify the tax system, and must apply to all transactions no exemptions) and in a country like the USA the political protection of States rights so it doesent just become a Federal Government take over. For example (as happens in Australia) all VAT collected goes to the states and the Fed gets income and corporate tax. In return all state sales taxes and some others are abolished and the States are given specific responsibilities that actually decentralise decision making and power not centralise it. It is one tax that no one can escape including criminals, as every time they buy something they are being taxed, including the rich as there are no tax minimisation schemes for a VAT and as the rich consume more in gross terms they pay more tax and importantly including the poor, as they also pay tax on everything they consume. At one stroke you save billions, generate billions more, and have every US citizen contributing to the country with the rich contributing more but no more freeloaders contributing nothing. Introduced properly prices of lots of items will actually drop depending on existing rates of sales tax e.g. in Australia the VAT rate was set at 10% and has never moved from that, but prior to its introduction a lot of white goods, TVs etc carried 15% sales tax, practically everything the average female used on a daily basis carried a tax of 27.5% as did sundry other daily items like vases for flowers, gifts in general etc. The only obstacle to a VAT is blinkered thinking and as mentioned earlier how it is introduced with relation to Federal Government/State Government safeguards and the all important factor of absolutely no lobbying being allowed for exemptions, not for food, not for books, not for Churches, not for anything or anyone – it is only by having it Universal that the rate can be kept low and it is only by having it Universal that the businesses and organisations acting as defacto tax collectors can simply process their activity statements each time period ( in Australia you can choose 3 months or 12 months, a small business may spend an hour every 3 months and can do it on line) to either remit what they owe or claim what they are owed (claims in Australia for small business are credited to your bank account within a week). It is lack of Universality & exemptions that Europe got wrong, and anyone who knows Europe should not be surprised at that! Consumer wise it would actually be easier to introduce in the USA as your consumers are used to seeing sales taxes on your price tickets, in Australia no one apart from from a minority (e.g retail managers, tax office officials, some economists) ever knew what tax they were paying and so there are still people complaining that they are paying 10% extra where in reality in a lot of cases they are actually paying less now than previously. 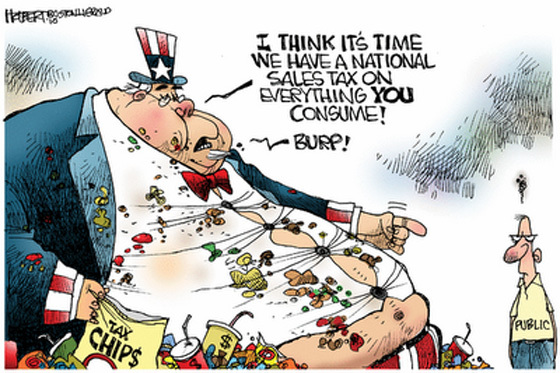 The details of Herman Cain’s 999 may have needed tweeking but the underlying principle of rationalising the taxation system and having one standard sales tax country wide was sound. I would be interested to hear anyone who knows of a system that is in economic terms as comprehensive and efficient as a propely introduced and implemented VAT/GST – once business gets to use it they would never want to go back to the complications of yesterday, and there is another benefit it helps the bottom line. In terms of small to medium business if they are organised they do not even need outside bookeeping or accounting help. Exactly! That’s reality about tax… Sad..